It's interesting when new LGBT movies come along that genuinely try to explore new aspects of the community. It's easy to focus on the usual stuff like coming out films and tales of the circuit scene. Heck, even stories about struggling with AIDS and such are also becoming a little old hat by now. So when something new comes along, it feels like we should at least invest a decent amount of time and effort to hearing their story. Gerontophilia is one such movie that rather surprised me given its subject matter. As liberal as I try to be, I don't think I was fully prepared to embrace a story about a young man who develops a bit of an interest in much older men. I suppose the closest I ever got to this was that one side-plot from the US version of Queer as Folk when Emmet got involved with an older gentleman. The story of this movie was put together in a rather respectful way that didn't cheapen things on either side of the fence. Admittedly I appreciated how they went about things, although naturally a few twists and turns here felt a little off still. But on the whole it was a fairly good story. 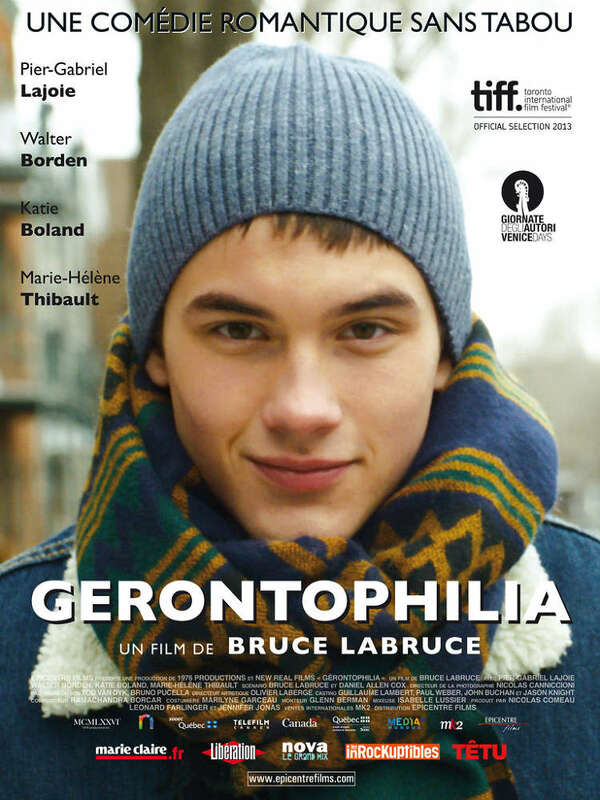 Synopsis: Gerontophilia is a Canadian LGBT comedy-drama written and directed by Bruce LaBruce together with co-screenwriter Daniel Allen Cox. It screened in the Vanguard section of the 2013 Toronto Film Festival. At the center of our story is Lake (Pier-Gabriel Lajoie), a young man who seems to have a simple enough life with his girlfriend Désirée (Katie Boland). But when he decides to take a job at a local nursing home where his mother works does he realize that he harbors a bit of an attraction for elderly men. He somehow finds the very fact that they have lived so long to be a beautiful trait and he uses his time at the home to study them further. At the nursing home he discovers that the residents are fairly heavily drugged in order to keep them docile. He also starts a friendship with Mr. Peabody (Walter Borden) and the two spend more and more time together as Mr. Peabody shares tales of his youth with the fascinated Lake. In time, things start to evolve into something more as Lake tries to explore his feelings and whether or not his attraction is strictly intellectual or if it could even be sexual. At first glance, it seems almost taboo to address a subject like this since this goes beyond your typical May-December type relationships. It's far too easy to stick to conventional standards of beauty and find the thought of naked elderly people to be repulsive or disgusting. And this movie tries to tackle that notion head-on through Lake's eyes and he helps present the argument for what makes them beautiful. At the same time, this story also indirectly tackles just how complicated sexuality can be. When you get beyond the basic heterosexual binary, you find that there's a whole spectrum of possibility when it comes to understanding gender identity and sexuality. And Lake is our driver in this particular conversation - the young man who might show us how it all may be possible. Thus this is more than just Lake realizing he's gay or something like that. I feel he truly does love his girlfriend, but at the same time his reflections about old age has revealed a new side of his character to himself. Truly, there may be ethical questions about the fact that Lake's explorations take place within the confines of a nursing home. We expect a certain code of conduct when it comes to those in the service industry and Lake's increasing adventurism while there is somewhat questionable. Then again, we all have our moments of foolish actions in our youth. And when it comes to the LGBT community, chances to explore and understand sexuality often take on unusual forms given the indirect limitations society presents to us. Lake's journey of fascination that goes all the way to something potentially like love (or at least a very, very deep friendship) is a novel one that remains fairly on point with a few dramatic bits. The movie is often billed as a comedy, but it still felt like more of a drama to me given the tone and treatment. There are no major laughing moments for you as a viewer. But the movie doesn't take itself too seriously either, hence the comedy tag I suppose. The complexity of things does make for a better movie experience. Gerontophilia is a honest effort to tell this story in a respectful and not overly scandalous manner. I can understand how it may not be everyone given the subject matter and maybe even just for some of the pacing issues that hurt some parts of the movie. But on the whole, it's still a good piece and gets 3.5 little games that Lake ends up playing with the residents out of a possible 5.